Unemployable was the word used to describe Roger at the end of an honours degree course in Business Studies, and the tutors assessment has proved to be true. A passion for all things vehicular, especially if graced with only two or three wheels, led to a career as a self-employed motorcycle instructor, at a time when the training industry was completely unregulated. This dedication to helping young riders led to a the creation of Cyclecraft Motorcycle Training in 1981, a business that has gone from strength to strength, and has now moved to Durston Elms, giving a range of services to the rider and car driver that are second to none. Instructor turned garage-owner, this bike-nut, restless and impatient for an impeccable standard of service, is still probably unemployable. 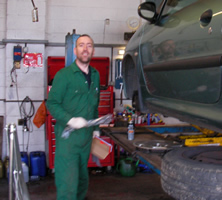 Mark Eveleigh, a one-man service centre who is never really happy unless all the ramps are full, with more cars waiting; workshop manager, mechanic, expert in customer care. Mark has a wealth of experience in all kinds motor vehicles as well as the latest computer technology you may need to manage them. Anyone who has brought up on a farm on the edge of rugged Dartmoor learns to take the rough with the smooth, and with such a background, Lindsay is the ever-optimistic hub of the many and diverse activities at Durston Elms. Car and motorcycle instructor, petrol pump attendant and village shop keeper, but mainly administrator and record keeper, this Harley-riding Hells Babe has that unique ability to keep cool and remain smiling when all those around are losing their heads  thankfully.